Net Weight (Empty) 366 LBS. Electrical Requirements Units Plug Directly into US 110 Volt outlet on a 20 Amp Dedicated Circuit. What is the capacity of bottles? BEST ANSWER: Enter an answer to this The answer that statees capacity varies is correct. First thing you have to account for is the layout you want. The maximum capacity contemplates that you will stack bottles on top of each other and not put in the maximum number of pull out shelves. But most people I know find stacking impracticale as getting at the bottles on the bottom of the pyramid would be a pain. If you plan to use 10-12 roll out shelves that will lower capacity. If you use a display rack, that will lower capacity even more. And the type of wine you drink will also have a big impact. Let me try to offer some examples in case that helps. In my experience, most of my French wines (Bordeaux, Burgundy and Chateaneuf) fit 12 bottles to a shelf. Most of my Italian wines also fit 12 to a shelf but not always. For example, I have a Brunello that looks like a standerd Bordeaux bottle but it has a higher than normal shoulder, limiting my ability to put the bottles close together leading to only 10 bottles on a shelf. The real trick will be if you like California wines. It seems every winery in Napa is trying to have the biggest and heaviest bottle. This can have a real negative consequence on your storage capacity. For example, I have a number of bottles of Hewitt Cabernet. Those bottles are so big I can only get 8 to a shelf. But worse yet, the shelves won't close at the "normal height" so I had to adjust the shelves to add more space, which, depending on your configuration can cause you to loose a whole shelf. Be realistic about your layout, your needs and your expectations. I have 10 sliding shelves and 1 display shelf in each of my units. With that layout I can get about 150 bottles in each of my 2 units. And, I too am happy with them..
As stated on the website the capacity can vary based on the bottle shape. The listed capacity ionly holds for standard Bordeaux bottles. The reality is very few wines fit that description. I would say a safe bet is to count on losing a 1/3rd of the advertised capacity. On the plus side the units have performed flawlessly. We basically use the 2 open shelves on the bottom for some special cases (4), and with the 20 roll out shelves holding a dozen each we comfortably can pack 288 bottles in there. Hope this helps. How many bottles will it hold? You can fit appx 320-340 bottles depending on bottle size and shelf configuration. Can this unit be installed in a garage / non controlled temp room? Yes. I purchased two of them and have them sitting next to one another in my garage in LA. They work perfectly. I live in LA so my garage ranges in temperature from the 50s up to the 80s so fairly wide ten range. Per the manual, the units are functional when ambient temperatures are between 32 and 86 degrees Fahrenheit. If your garage is always in this range I would think it would work. Hope this helps. However, in my casa the shels keep folling whi loaded. Would recomend to look at other brands with sturdier shelfs. Depending on where you are I would suggest getting the solid doors which will allow the units to go up to 95 degrees. Maybe but I would not. Too nice a unit and I would think the compressor would run too hard. What is the clearance height between each shelf in standard configuration? The shelves can also be adjusted and you have the ability to skip a shelf entirely. Hello, I'd like to purchase the EuroCave Pure Double L Wine Cellar and put it in a recessed wall, essentially an opened up closet. The unit would have 1" clearance at the back, 3.5" on each side and 8" in height. Can I do this even though this is not a "built-in" model? That sounds like it may be ok. 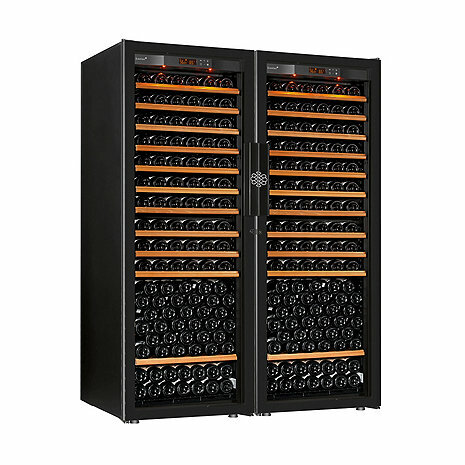 Please contact one of our Wine Cellar Specialists @ 1-800-356-8466 so we can go over other factors. No this wine cellar will not work for you because it needs to be well ventilated. I wanted to use the Double Pure L as an addition to my wine cellar and place in in my lower level. There are times when I could go 4-6 weeks without coming out to the house and therefore EuroCave would not be opened or used for that time period.. I thought I read somewhere that if you are gone more than 3 weeks you need to empty cellar, which would be a problem for me. Please explain. Thanks. BEST ANSWER: The Eurocaves are the most reliable units on the market. If you are gone from the residence for weeks at a time it will not be a problem. If the unit loses power the unit will come back on when the power is restored to the residence. Some of the other brands do not have this feature. Are these two individual units side by side and if so how are they coupled together if at all? Yes, they are two separate units. One with a right hinged door and the other with a left hinged door. They sit next to each other without any attachment. The true capacity for each shelf is 12 bottles based on Bordeaux bottles. Really wasn't going to spend as much as I did; however, the extra dollars spent were WELL WORTH IT!!! Besides the beauty of the two boxes... they are so quiet... much more so than the other wine coolers I've had for the past 7 years. The ease of loading my bottles of white was worth the extra dollars as well...as now the larger Chardonnay bottles fit with No problem, no rubbing off the labels or having to force the shelves in or out. Now I can easily find exactly what I'm looking for without a hassle, which again was worth the few extra bucks. The only draw back I have is, the units are a bit larger than my old ones, but their operation is so much better. My cellar holds 2200 bottles, so space, ease of locating specific bottles, and noise are all important factors for me, and the EuroCave Pure Double L has been a blessing for my white storage. Add to that, the 5 year warranty that John Tucci arranged for me was just more icing on the cake. - These are quieter than our GE Profile Refrigerator in the kitchen! - They are beautiful without being oppressive. - Racks are very easy to customize. I purchased 8 units at one time. Overall pleased, but they do not keep consistent temperature and humidity levels. And, larger 750 ml bottles do not fit in the racks as well as I had hoped. Still new to me, so have high hopes for long term satisfaction. Solid capacity; really like the overall features; very quiet units. Aesthetically appealing as well. It is a good quality cooler, the self-closing shelves work about half the time though. The temperature seems to fluctuate 4 to 5 degrees even in an air conditioned room. Oversized bottles will have their labels torn when closing the shelves. Its a good cooler, just overpriced. David was great in his guidance on product selection. So far so good! Handsome couple...everyone Luv's them.. As they said its furniture for the room...husband is loving filling them up!